Today’s project was designed to solve the need to enter, using a keyboard, the same sequence of characters (a password, a greeting…) many times. You can send the characters to be typed through the serial connection; in addition the device supports some commands to save/clear the sequence of characters and to include/not include a “return” at the end of it. All the project’s files (schematics, pcb, firmware…) are available on my Github’s repository. 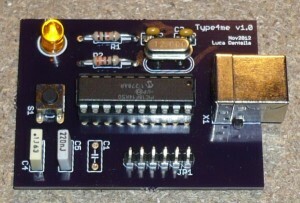 The heart of Type4me is a PIC18F14K50 microcontroller, that includes a slave USB peripheral used to communicate with the PC. 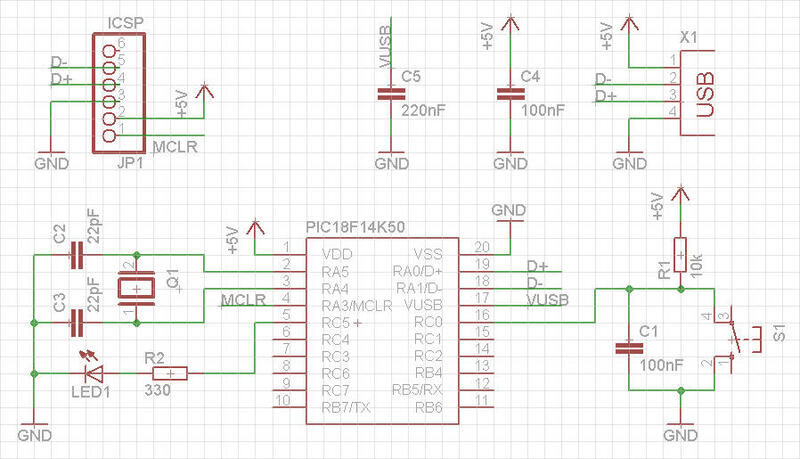 The microcontroller needs a 12MHz clock for USB operations; clock provided by Q1 crystal with C2 and C3 capacitors. C4 and C5 capacitors are used to decouple the power supply. 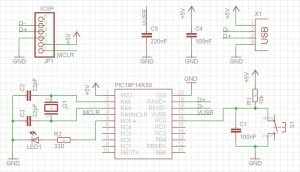 Partlist includes the S1 switch, with its pull-up resistor R1 and the (optional) C1 capacitor for de-bouncing and LED1 led with R2 resistor. JP1 connector is for programming the microcontroller using an ICSP programmer (for example Microchip’s PICkit).